Make a lovely spring flower bouquet using yarn! Yarn wrapping is a great way to sneak in fine motor skills for toddlers and preschoolers-- though kiddos of all ages will enjoy this easy flower craft. 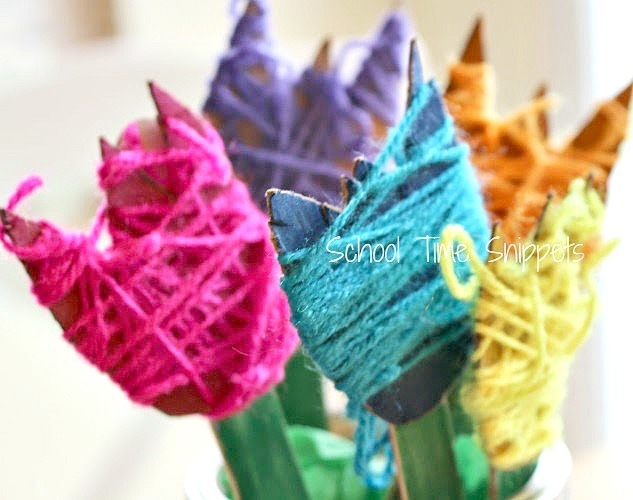 These beautiful yarn wrapped flowers are easy to do and are fun to make! 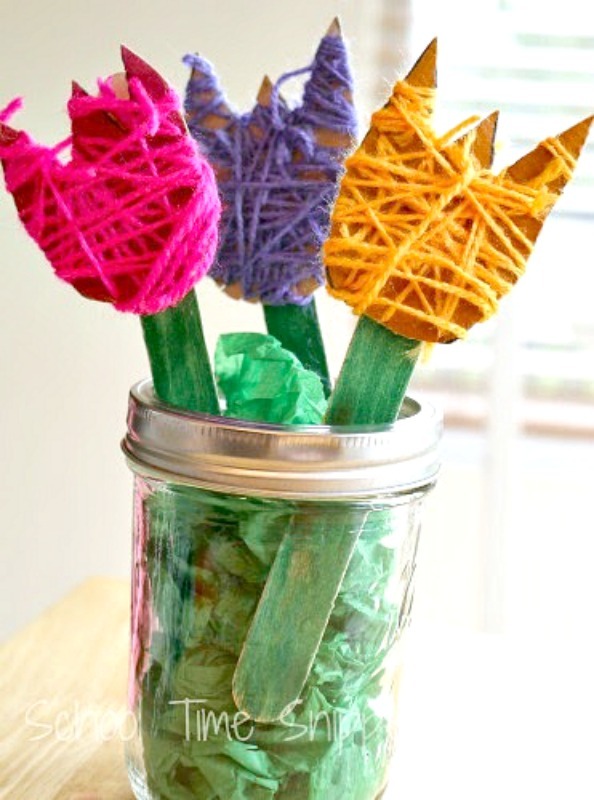 Create your own yarn wrapped flowers to enjoy all year-long. 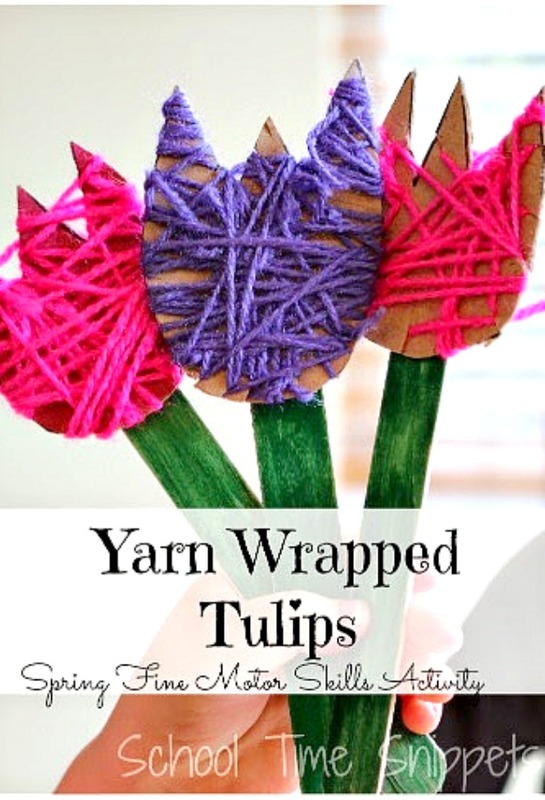 I loved our yarn wrapped rainbows so much that I am sharing another activity involving yarn today for Fine Motor Friday... learn how to make these beautiful Yarn Wrapped Tulips. This easy flower craft can be enjoyed all year long! On a side note, I love that this Fine Motor series allows me to share my crafty ideas that are not necessarily homeschool related; partaking in this series has been so fun for my kiddos and we hope you have been inspired by all the fine motor activities from us and fellow co-hosts! Anyways, it seems like our yarn wrapped rainbow craft was a big hit with many of you, too. 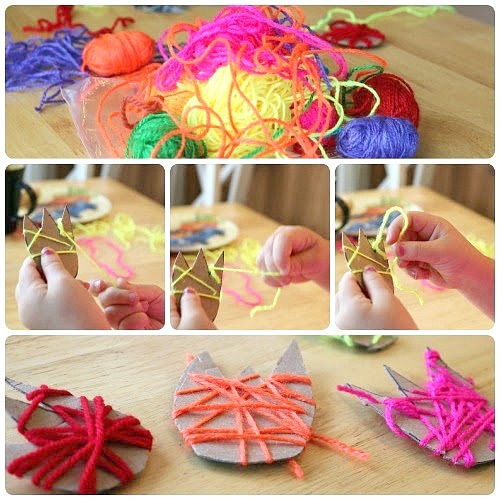 Yarn wrapping is a great way to sneak in fine motor skills for your little ones! Fine motor skills such as Pincer grasp, wrist rotation, hand-eye coordination and more are strengthened through this simple yarn wrapping craft! Set up was simple; I free handed some tulips on a piece of cardboard and had the kiddos wrap them up with yarn. I cut slits along the edges of the tulips to make it easier to wrap the yarn. The tulips seemed to be a bit trickier than the rainbows, so be ready to help out, if needed. With little ones, tuck one end of the yarn into a slit or tape it down to the back of your tulip. Then, wrap away to your hearts content! Wrap the yarn side-ways, diagonally... any which way- the point is to strengthen fine motor skills while covering the flower with yarn. We started wrapping them over the brown cardboard, but once we had made several, I realized I didn't like the brown showing. So... after they were wrapped, I quickly colored in the brown spots with a coordinating color marker. However, that is personal preference-- not something you have to do. To make the stem, Big Brother and I colored some craft sticks green and slid them onto the back of the tulip. 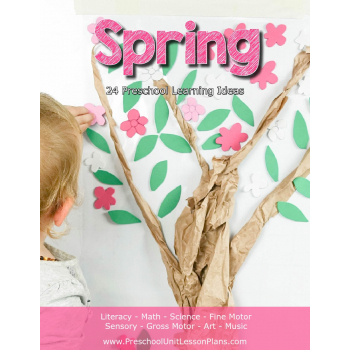 Finally, add them to a jar and you have a beautiful and easy flower craft that sneaks in plenty of fine motor practice! Enjoy these yarn wrapped flowers all year long! If you are gifting this sweet bouquet to someone you love, you might also like our Photo Flowers-- another lovely keepsake! 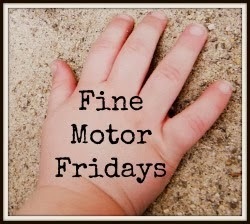 This post is part of an ongoing series, Fine Motor Fridays. Take some time to see what the other creative co-hosts are sharing today! 19 comments on "Easy Yarn Wrapped Flowers Craft"
How lovely these came out! And you're right - great Mother's Day gift! Oh oh! These are adorable! What an awesome fine motor activity!! They came out so pretty! This is so cute! I want a yarn wrapped tulip bouquet! Finally I am getting disqus to load. Ugh! It has taken me weeks to figure out "why" but it's so frustrating because there isn't even an error message. Just in case anyone has a problem commenting, they may be using Avast and need to disable the extension before disqus will fully load and give you a box to comment in. ...on to a comment :) These tulips are just darling! Reminds me of our HOD lesson on tulips a while back. I like this idea, did it take you long to make these? YES! You are right, it does remind me of the Holland/ Tulip lesson in HOD-- totally forgot about that! I love yarn crafts. they are so much fun! Great ideas. An awesome project! I'm certain each child would enjoy doing these! 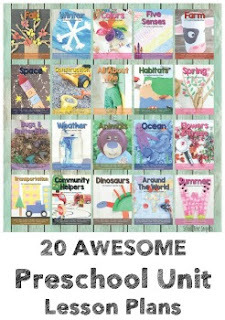 I love this and think that it would make a great Thank You teacher gift - I am featuring it on the Kids Coop thank you for linking up. Adorable flowers! 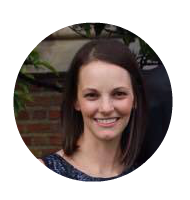 I featured them last week on Mom's Library but didn't get a chance to stop by and tell you! How cute are these! Such a great idea- definitely going to be doing these soon! Thanks!